Now you can watch Totally Wild before getting back to Call of Duty. Microsoft and Network Ten today announced the launch of the Network Ten Xbox app, a video-on-demand service that will go live later this week and give Xbox Gold Live subscribers access to more than 25 programs. "We are delighted to be the first Australian commercial free-to-air network to join forces with Xbox to provide its consumers with new entertainment, comedy, reality and news content," said Rebekah Horne, Network Ten's chief digital officer. The launch also coincides with Network Ten's "TV anywhere" strategy launch, which signals possible app launches across multiple platforms and devices. "Our goal is to deliver a TV experience anywhere that consumers are engaging with video content," Horne said. 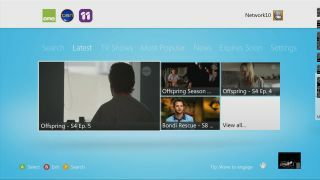 The Network Ten Xbox app will allow users to navigate the app using voice and gesture commands through Kinect. It will currently play ads during programming breaks, but using Kinect technology, Network Ten could potentially target its ads in the future. Jeremy Hinton, the Interactive Entertainment Business Lead for Microsoft Australia, said that they are thrilled to be adding Network Ten programs to the Xbox content library. "Our aim is to provide Australian Xbox Live members with the best and most popular television content, alongside movies, music and games, and now they will be able to access some of Australia's highest rated local and international shows," he said. Expanding on its catch-up service, which is available on its website, programs on the Network Ten app will include Offspring, The Graham Norton Show, Bondi Vet, Bondi Rescue, The Living Room and Totally Wild, as well as live news coverage. The app will be available for download by Xbox Gold Live members from July 10.